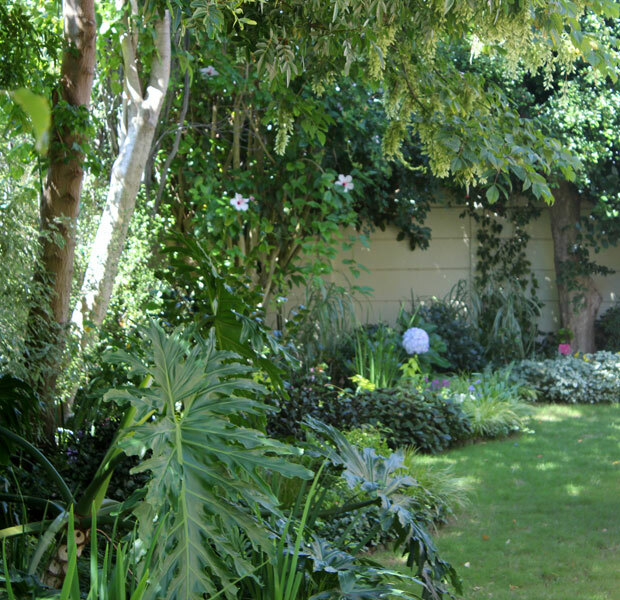 Foliage has played a major role in providing interest and colour in my late summer garden here in sunny Cape Town. Its been a hot, dry month and although I’m sure we are not over the heat of summer just yet, I think our hottest days might be over. I didn’t plan very well for a flower show this summer – partly because I was distracted in October and November last year and partly because I was concentrating on adding foliage interest in the garden. How fortunate it is that I ‘fell in love with foliage’ as it is the different colours, shapes and textures being provided by all the foliage that make my Summer garden pop. I’m a few days late in joining up with Pam at Diggings for February Foliage Follow Up, a monthly gardening meme where Pam and other garden bloggers showcase the beauty of foliage in their gardens. 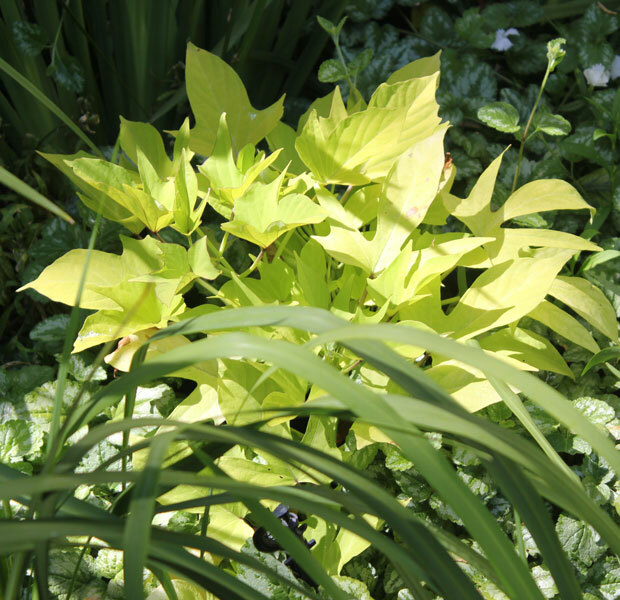 So let’s get right to it – Here are some of my favourite foliage plants and combinations right now. Apart from the few Angelonias, this entire area is a mass of colour not from blooms but because of the different foliage used. Another favourite foliage scene, my little “woodland”. As you can see there are a few lonely blooms but the area looks green and lush with interest provided by foliage. 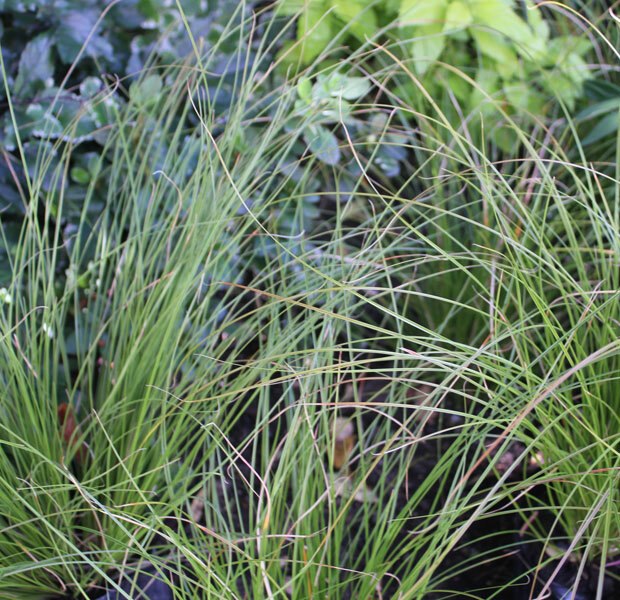 A new acquisition this month is Carex testacea ‘Prairie fire’. These plants are small so the wonderful orange foliage is hardly visible at this stage but given the right growing conditions and care, these should look magnificent ’round about next year this time. 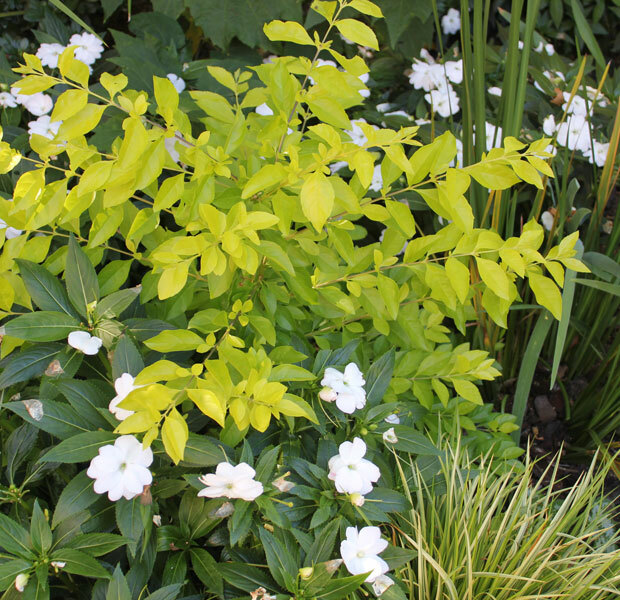 Another old favourite combo – the Duranta with Impatiens peeping through it. I realised today how much this shrub has grown. It had been left for dead after last years plumbing disaster – but has revived and is once again flourishing. So pleased about that. Again I love the colour which is a fabulous contrast in a foliage garden. Another favourite combo. Actually, to be honest, here I am just showing off my blue Hydrangea. The first bloom of the season on this plant was pink. We fed and mulched and (it seems) did all the right things and now her blooms are the desired shade of blue. Just the way I love it. If you know Pam or follow her blog, (if not, why not? ), please join me in wishing her a Happy 6th Blogga-birtha-versary! She wrote a lovely post to celebrate her 6th year of blogging at “My 6th Blogiversary and I’m still Digging Gardens“. Congratulations Pam! 6 years is amazing. Here’s to the next 6! Your garden is just gorgeous!!! The colour is amazing and the condition of your plants are incredible. You have really created a perfect environment for these foliage beauties!! That Carex Prairie Fire is a winner!!!! Hi! Your first photo is amazing! I love all the different types of foliage and what is the beautiful plant at the bottom of the photo with the round leaves? Looks kinda like heliotrope foliage but I don’t think that is it. Also, love the duranta with impatiens. Love that color! That first pic is great! 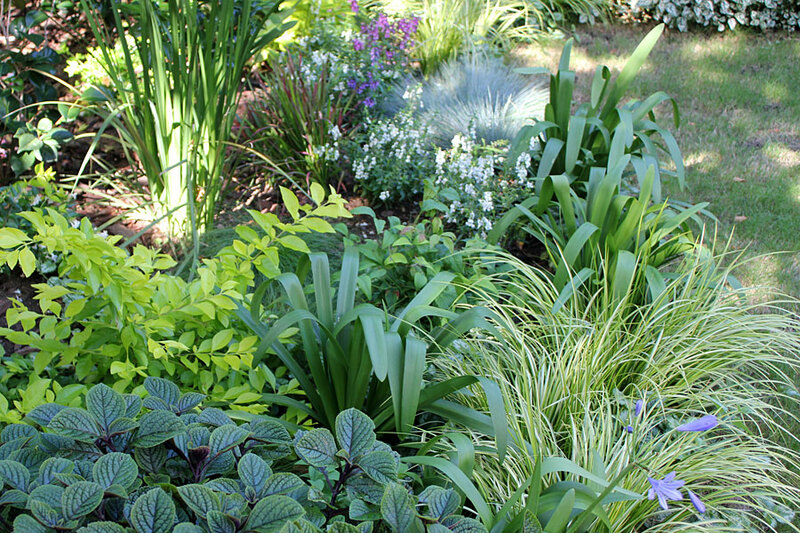 I see so much blue tinged foliage, even in the heat of summer, I bet your garden looks cool and refreshing. Great job! I didn’t realise that hydrangeas were so responsive, changing colour so quickly. Christine, in recent years its the foliage that is doing it for me although there will always be flowers in our garden. Your beautiful garden pictures are encouraging me to move on, the love affair with annuals is over. You are rocking that chartreuse foliage, Christine, and in fact all your borders are looking so pretty with great foliage combos! And that blue hydrangea is lovely too. Thanks so much for the link love and for the blogiversary wishes. You are very kind! Happy blogging to you too. I’m loving your foliage, especially your duranta. And your woodland area is delightful. 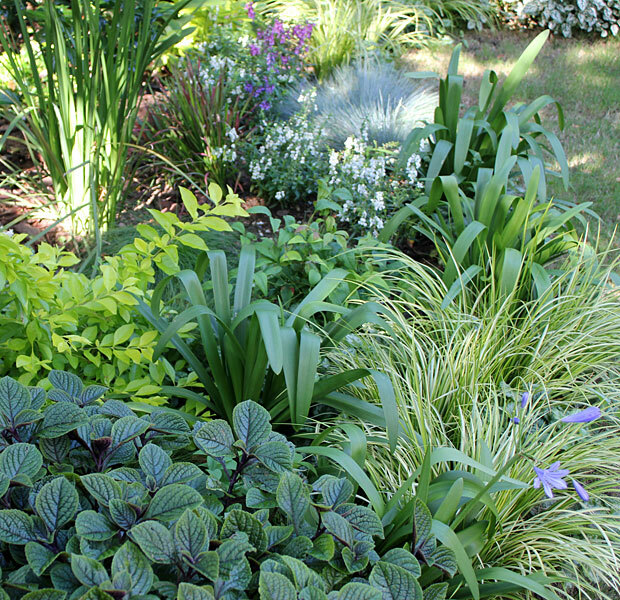 Foliage really is the mainstay of a successful garden! Great examples of the effective use of foliage! I LOVE Sweet Potato Vine!! If I ever have a sunnier garden, I will plant generous amounts of it in all its glorious shades! For now, Coleus is my fave for colorful foliage because it grows so well in shade. Great post! What beautiful foliage displays. Particularly like your little woodland. I need to com here for my foliage fix at this tome of year. What a contrast to the gardens in the Northern hemisphere. 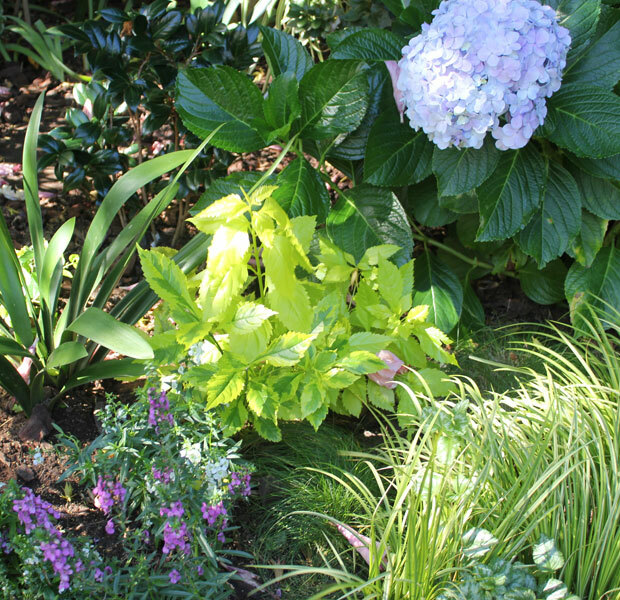 Everything looks so lush in your garden with some beautiful but subtle colour combinations.